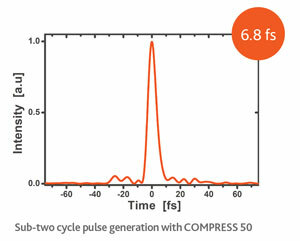 Compress, the industrial pulse compression module, offers a unique combination of throughput efficiency and compression ratio to help you reach the maximum peak intensity in a cost-effective manner. The Compress-10 version allows to reach the few tens of femtosecond regime with state-of-the-art > 80 % throughput efficiency, whereas the Compress-50 can turn our industrial Ytterbium lasers into few-cycle laser sources with > 50 % efficiency. > industry leading short and long term stabilities. It makes our Compress the indispensable companion for any Industrial Ytterbium Lasers. Click here to learn more about this module.